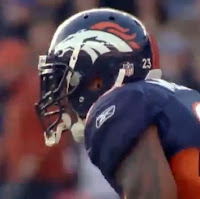 The Denver Broncos released veteran running back Willis McGahee earlier today, something McGahee said he could see coming. In a way, the Broncos did McGahee a favor by cutting him now and giving him a chance to catch on somewhere else, possible before training camp. Coach John Fox said after practice that it would have been a "hard pill (for McGahee) to swallow" if the team had kept him as a backup or cut him closer to the regular season. With that said, McGahee may have a hard time catching on somewhere else. The free-agent running back market includes Kevin Smith, Beanie, Cedric Benson, Michael Turner, and Peyton Hillis. That's a lot of un-signed running backs, but McGahee should eventually land on his feet. Fox also reiterated that the move was all about getting younger at running back, adding, "It's more to do with the confidence in the guys we have here." The three main guys they have remaining on the roster—Knowshon Moreno, Ronnie Hillman, and Montee Ball—combine to average 22.6 years of age. McGahee is going on 32. That's a difference of over ten years. Going younger, indeed.